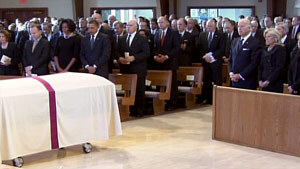 The Obamas and Bidens attend the funeral of Vice President Joe Biden's mother, Jean, on Tuesday. Vice president: She was "heroic in her ideals but solid in her expectations"
(CNN) -- Vice President Joe Biden led mourners at his mother's funeral Tuesday in remembering her as a "remarkable woman" who was the "quintessential combination of both optimism and pragmatism." Political leaders from across America -- including President Barack Obama, former President Bill Clinton and House Speaker Nancy Pelosi -- came together for the funeral of 92-year-old Catherine Eugenia "Jean" Finnegan Biden, who died Friday at the family's home in Wilmington, Delaware. First lady Michelle Obama also attended the funeral Mass, which was held at Immaculate Heart of Mary Catholic Church in Wilmington. Jean Biden was "a remarkable woman," the vice president said. She was "heroic in her ideals but solid in her expectations." Among other things, the vice president said, his mother taught family members "failure at some point was inevitable in everyone's life, but giving up was unforgivable. She taught us to be respectful toward everyone but deferential to no one." "Our mother," he added, "was proud on the edge of defiance, generous to a fault, and committed to all those she loved to the end." She taught friends and family never to "be intimidated by power, wealth or station," he said. The vice president's father, Joseph Robinette Biden Sr., who was married to Jean Biden for 61 years, died in 2002. The vice president was Jean Biden's eldest son. Her other survivors include sons James Biden of Pennsylvania and Francis Biden of Florida, daughter Valerie Biden Owens of Pennsylvania, and many grandchildren and great-grandchildren.